The HomeSync app itself is useless unless you pair it with the HomeSync Media Hub, which has not been released publicly. Essentially, HomeSync is your personal cloud storage (1TB capacity) and media player. It is powered by Android (Jelly Bean 4.1) with a dual core processor. Of course, you can use the device as a Google TV box without using S4. You may consider this device as Google TV+ WD My Book Live. 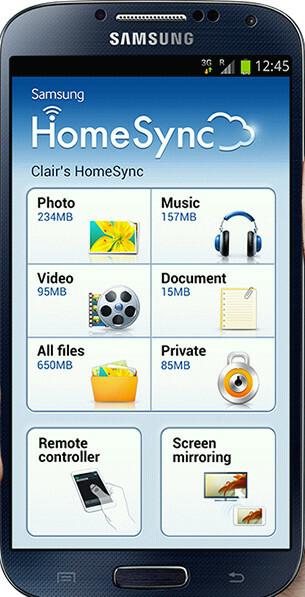 The trick part involving Galaxy S4 is the full control of the HomeSync with your S4. You may also mirror the screen to TV without using any adapters. As a cloud storage device, you may upload and sync documents with your S4 automatically, just like other cloud services. But you have 1TB storage for all your stuff. You may check the YouTube video below to know more details about this device. Any questions or tips on this feature? Post them in the comments section below, or discuss them in Galaxy S4 forum.